Disgo 8100 tablet review - the 8100 is a slim 10.1-inch Android 2.3 tablet offered at a very affordable price. The tablet itself doesn't offer any cutting edge technology but will perform few simple tasks on the go. It is very similar to the Disgo 8000 tablet which we reviewed some time ago with just few small improvements that have been made. 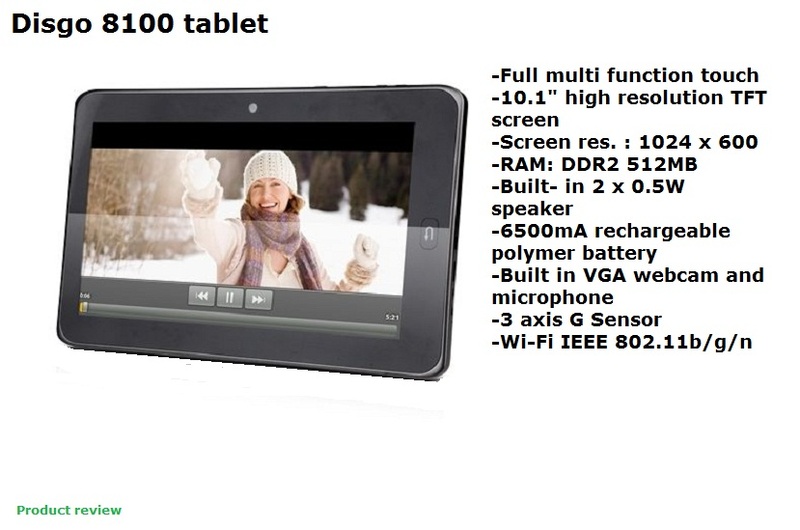 Disgo 8100 tablet relies on 1GHz single-core processor (iMAPx210, 1GHz, 16KB L2 Cache, 266MHZ bus clock) and 512MB of RAM. The 10.1-inch capacitive multi-touch display has a native resolution of 1024x600 and offers relatively good picture quality. The space for storage in this tablet isn't much, just 4GB but it is easily expandable with a additional micro SDcard (up to 32GB). Connection options include fast 802.11b/g/n WiFi connection and some useful interfaces like 2x mini USB ports, mini HDMI and 3.5mm headphone jack. The Disgo 8100 tablet is equipped with VGA camera and mic. The sound is provided by 2x 0.5W speakers which aren't very loud but at least there are two of them unlike many other cheap tablets which have just one. The operating system is the well known Android 2.3 Gingerbread which has been around for quite some time. Disgo 8100 tablet has a 6500mAh which is good for several hours of heavy-duty use. The price for the Disgo 8100 tablet varies around £80-90.